Signal Technology Corporation, Systems Operation J-9100 is a high power, two way power divider designed for applications up to 150 watts CW. 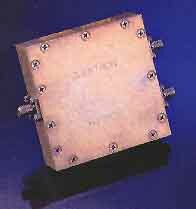 This is a 0° power divider or combiner, covers a frequency range of 800-1000 MHz and features an insertion loss of 0.25 dB max and isolation of 20 dB min. Other performance characteristics include VSWR of 1.3:1, phase balance of ±3°, and an amplitude balance of ±0.1 dB. It is ideal for next generation cellular applications. , 28 Tozer Rd., Beverly, MA 01915. Tel: 978-524-7211; Fax: 978-927-9328.